Cremation has become increasingly popular in the last two decades. The cremation rate in the U.S. has grown from 14.9% in 1985 to an estimated 44.2% in 2015, according to the Cremation Association of North America (CANA). New Hampshire is seventh in the nation for cremations at 66.7%. With the cremation rate steadily growing, it’s no surprise that people would look for new and different ways to handle their “cremains” and that an industry would grow up around providing people with just that. Make them into jewelry – Whether a pendant, bracelet, locket, or even a diamond, a small amount of ashes can be used to create a keepsake item of jewelry. Life Gem, for instance, will create a high-quality diamond from a lock of hair or cremated ashes. Use them to grow a memorial tree – Want to go green? 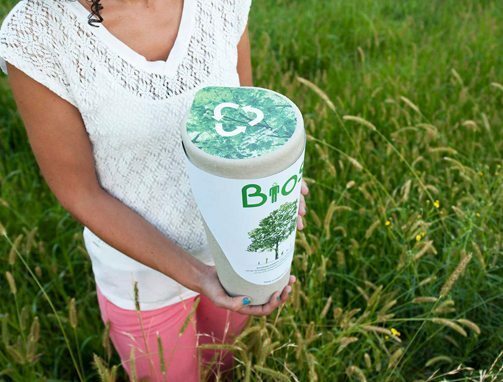 Bios Urn is a biodegradable urn that contains ashes, soil and a seed that will grow into a tree. Bios Urn currently offers eight tree species, but you can use any kind of seed. Help rebuild a coral reef – The cremated remains are incorporated into an environmentally-safe cement mixture used to create artificial reef formations. Eternal Reefs will place the “urn” in a permitted ocean location that you choose. Incorporate them into blown-glass sculptures – Rising Phoenix Glass in Ohio, will encase a small amount of cremation ashes into blown glass to create unique artwork. Make bullets out of them – The ashes are placed in live ammunition – caliber and gauge can be specified to best reflect your loved one. Holy Smoke is a business dedicated to the ashes-to-bullets service. Use them in a tattoo – Carry your loved one with you always – and permanently – by having his or her ashes mixed in with ink for a tattoo. Send them off in fireworks – Several companies, including Heavens Above Fireworks, will incorporate the ashes into fireworks to send your loved one out in a spectacular burst of pyrotechnics. Cremation Solutions offers the option of creating an urn in the likeness of the deceased. You can choose from a bust or an action-figure-like model in a variety of styles, including Indiana Jones and Superman. Press them into a vinyl record – And Vinyly, a UK company will press ashes into a vinyl record with music of your choice. You get 30, 24-minute copies of a record, each one containing a bit of ash, for £3,000 ($4,000 USD). For the more unconventional; the website is not for the faint of heart. And if you’re considering what to do with the ashes of a pet, most of these services are available for pets as well as their masters. My grandmother just recently passed away and she wants a cremation service done. My family and I have been wondering what she would want us to do with her ashes. I like the idea of using them to grow a memorial tree. I didn’t know that certain urns could help with tree growth. My grandmother loved nature, so I think this would be a perfect tribute to her.